Ahhh tomato season. A little bit of heaven. I went to the outdoor market up the road yesterday, and came home with a bushel of small tomatoes. Ever the kitchen wizard, I decided that I would make something a bit elevated for dinner. 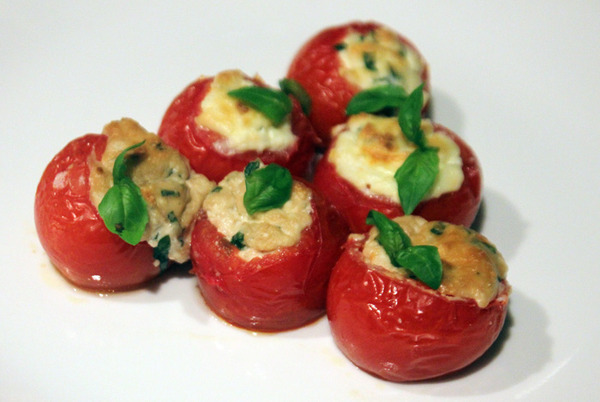 Cheese stuffed tomatoes. This is sort of my take on a caprese style dish. Sometimes the simplest ideas can be oh so delicious. Preheat the oven to 400′ degrees. Cut the tops off the tomatoes and scoop out the insides into a bowl. Add all the ingredients into that same bowl and mix well.